We are happy to announce the results of our field measurements which seem exciting to us for many reasons that we are going to explain in this post. 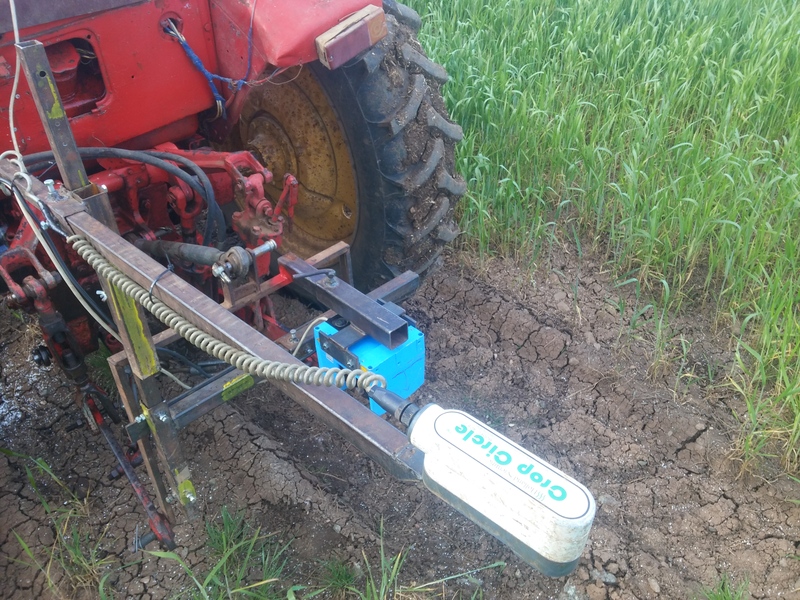 In order to start capturing measurements from both Crop Circle sensor and SICK sensor we had to construct a custom arm which we would then attach in the tractor hydraulics. This gave us the ability to test sensors in different height positions and decide which one is the best. This arm was built by welding iron bars and plates and the result can be seen in the picture below. As you can see, we have already mounted both Crop Circle sensor and SICK sensor. Crop Circle is a bit higher because it is supposed to capture acceptable measures from about 0,5m to 1m distance from the crops. This set up is somewhere in between. So, after finishing the arm construction and proper strength testing, we visited the wheat field and started capturing measurements. Now before we continue explaining tech stuff about measurements, we have first to tell you what we expected to see. 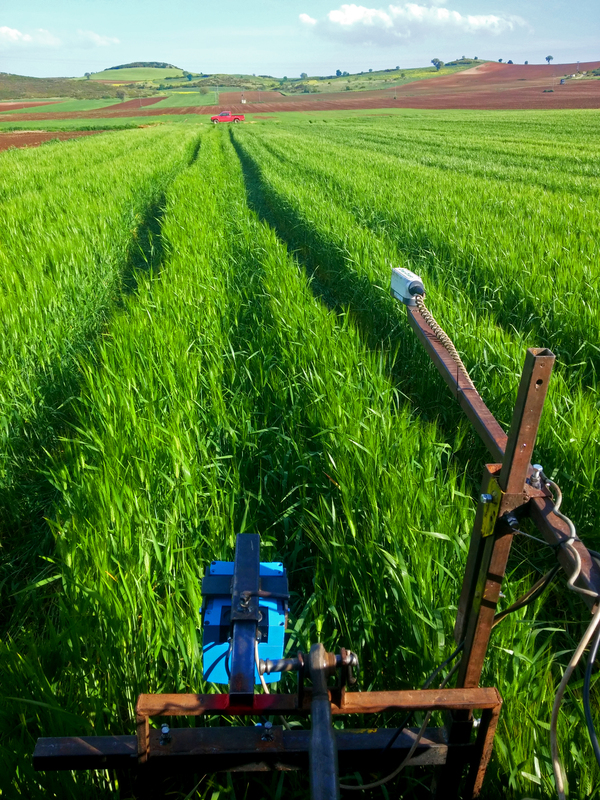 The wheat field participates also in a sustainable cultivation program conducted by University of Thessaly, Volos, Greece, Department of Agriculture Crop Production and Rural Environment. This is best for us in order to validate the accuracy of our measurements and you will soon understand why. The 50stremma or 12 acres field is divided in half. The first half is cultivated by the supervision and advice of Dr. Christos Kavalaris - University of Thessaly, while the other half is cultivated traditionally as the farmer would do. Despite the fact that both parts have the same wheat seed and variety, different fertilizing policy was followed. With the eye of an expert, one could quite easily tell that in this stage, the University monitored field is healthier with bigger leaves and bigger ears. So we expected to see this fact appearing in our measurements too. And this is exactly what happened!! In the University field we were getting NDVI measurements within a range of 700 - 780 while in the traditional one 600-700. This is clearly showing the lack of nutrition in the traditional cultivation. 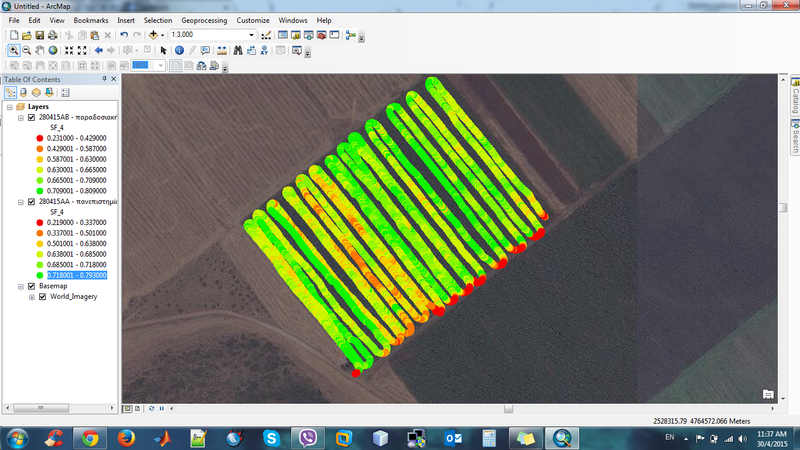 When we finished this process, we combined GPS with NDVI data and inserted everything in a GIS software (ArcMap) and created a data scale. Max values would be coloured green and min values would be coloured red. Between these, we had 4 other zones of values and colours between green and red. So we placed all values in a map and we then had a complete image of our field! In this map you can clearly see that when we exited the field and entered the road, we were getting low measurements (red) because the road has no vegetation at all! Also you can clearly see the lack of nutrition in the left (traditional field) as it is coloured orange, yellow etc. As a result, we consider these measurements precise and valid. After this process, we applied 8kg of ammonium nitrate fertilizer in the university field and then we irrigated the field. We will visit it in a week or so to capture measurements again. We expect to meet better ones in both parts but in the University part we expect to see even better measurements. Note: Unfortunately we were not able to use SICK sensor for measuring crops height because it was disconnecting from the computer all the time. We will create a bracket for the computer and place the cables in a better place and order and we hope this will solve the issue in the future.